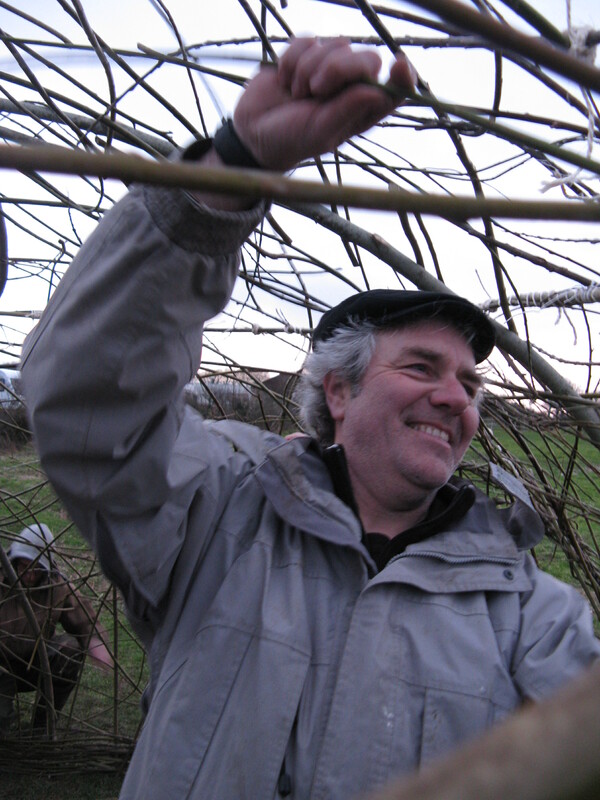 Jan 2011 – Having been invited by Annie Lovejoy (at the Caravanserai Project) to return to Treloan Coastal Holidays and produce something from Jude and Tony’s Portscatho coppice. My first thought was to build up the living fedge we had started the previous year. However, having looked at it only 1 in 4 of the living stakes had rooted and taken!! I was amazed. Willow grows everywhere, it’s usually the case that you have to manage it to stop it spreading!! Well you live and learn. I think the problem was the clay rich, highly compacted ground which sat on top of gradually disintegrating granite, combined with a necessary cut and plant in August 2009…but I might be wrong. Any willow experts out there want to give some advice? Anyway. Instead of flogging a dead horse Pete and Debs who run the campsite said they would rather have a willow structure created in which kids from the campsite could come and play, shaded from the Summer sun. 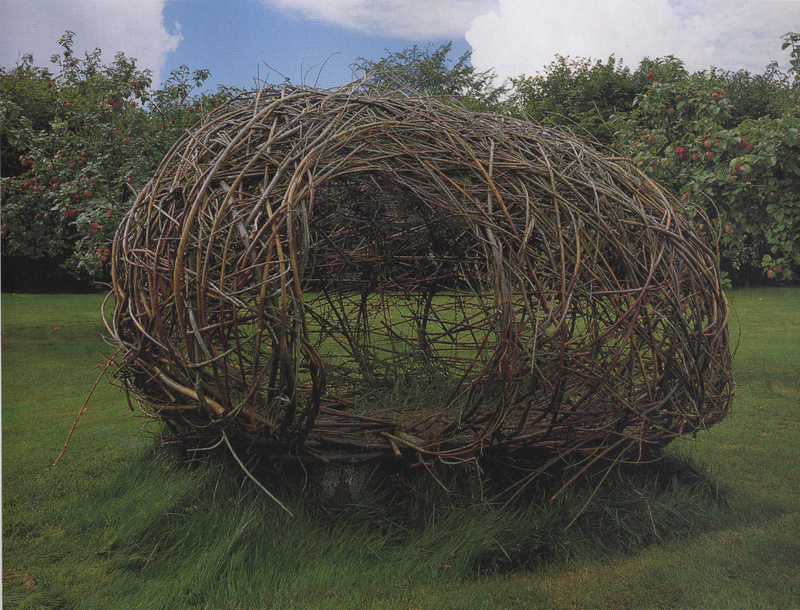 I was more than happy to oblige and found these fantastic ideas for willow structures in a Norwegian book Angel had given me. 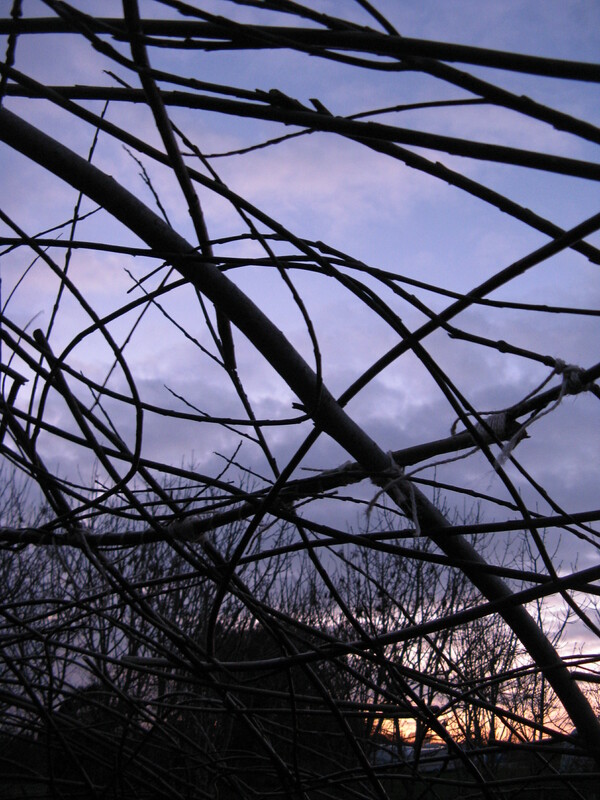 Mac and I went down the day before to the coppice to find and amazing crop of willow. Most wands were 6 – 8ft long thick as your thumb and no side soots. Perfect. We also pollarded a couple of older trees that were about to fall over, and planted some new trees. We left some work for the MA students to do the next day and retired to our beds. I was privileged to stay in “the Eco-Pod” on the campsite. A really amazing little wooden cabin, overlooking the sea with its own little wood burner and looking like something out of Hansel and Gretel! 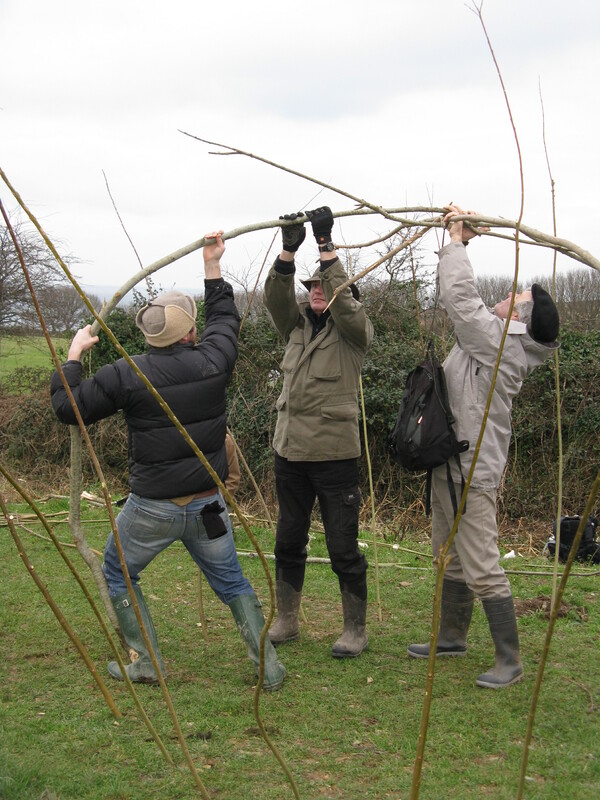 The MA students duly arrived and we all went down to the coppice to finish off our work from the previous day and extract the willow to use on the structure. The larger logs we stored at the campsite to season for charcoal burning in the summer. We didn’t get started until after a long, long lunch of local produce (very tasty). And began by marking out the holes to place the long straight willow uprights for the skeleton of the structure. Good to see Daro getting stuck in! 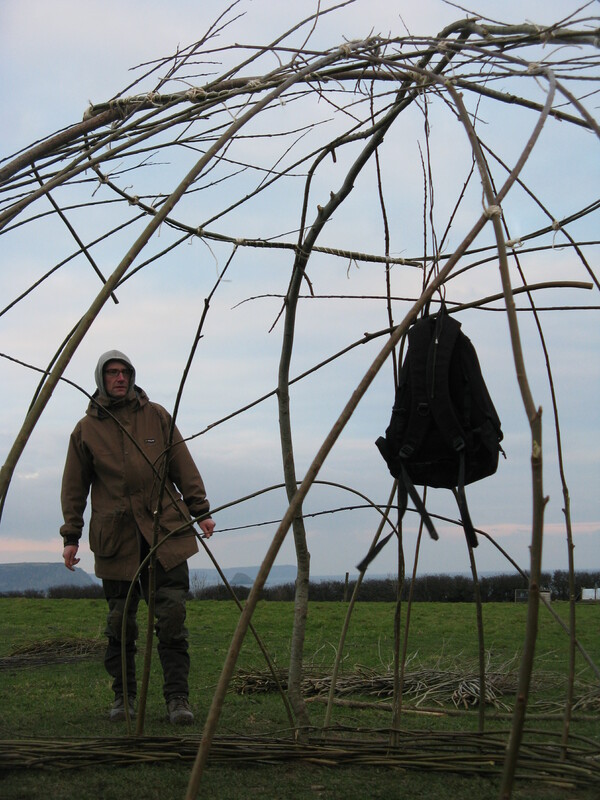 We then did a simple 3 stick weave around the bottom of the structure for about 4 – 5 turns to secure the uprights in the ground and provide stability to the structure. After that it was a case of bending the uprights into the centre, tying them together and hanging a weight (my rucksack) from the centre point to provide the “rounded” shape we were looking for. It’s worth noting that some of the poles were not long enough to reach, so thanks to the student who came up with the idea of placing an “O” ring of woven willow over the centre and tie the shorter ones to that. Group mind working well. Phew! Uprights tied, weight hanging, bottom woven and “O” ring tied off. 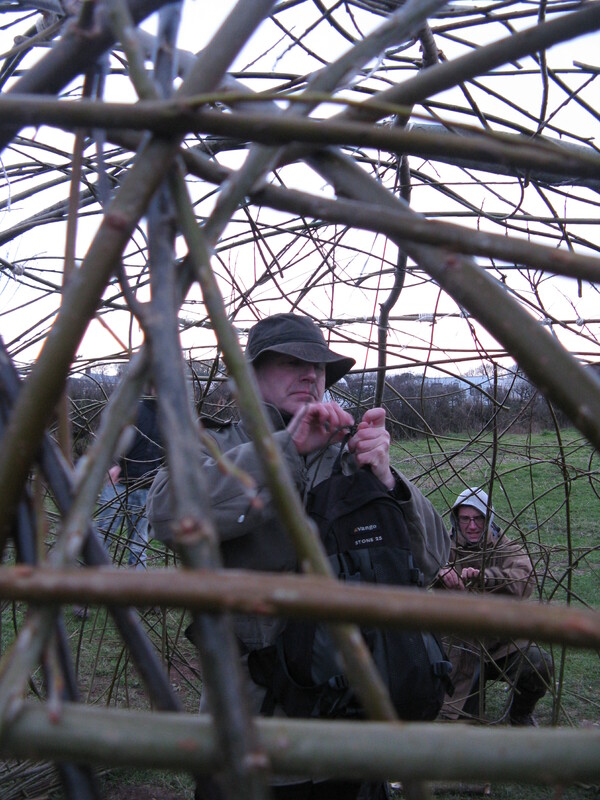 Then all that is left is for everyone to grab sticks and randomly weave them into the structure. 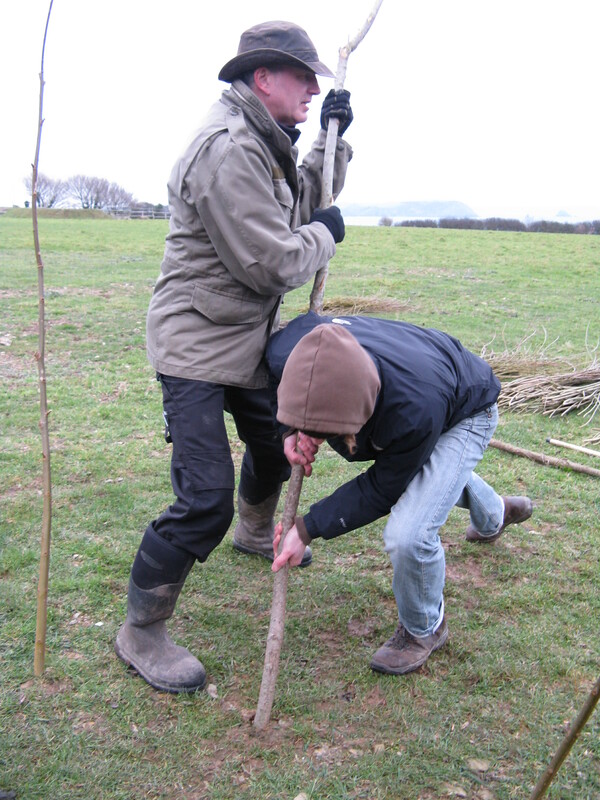 The more sticks you weave the stronger the structure becomes. It’s also the fun bit! Bending the willow wands to take advantage of their inherent strength works the best, and curves look much nicer than straight lines. 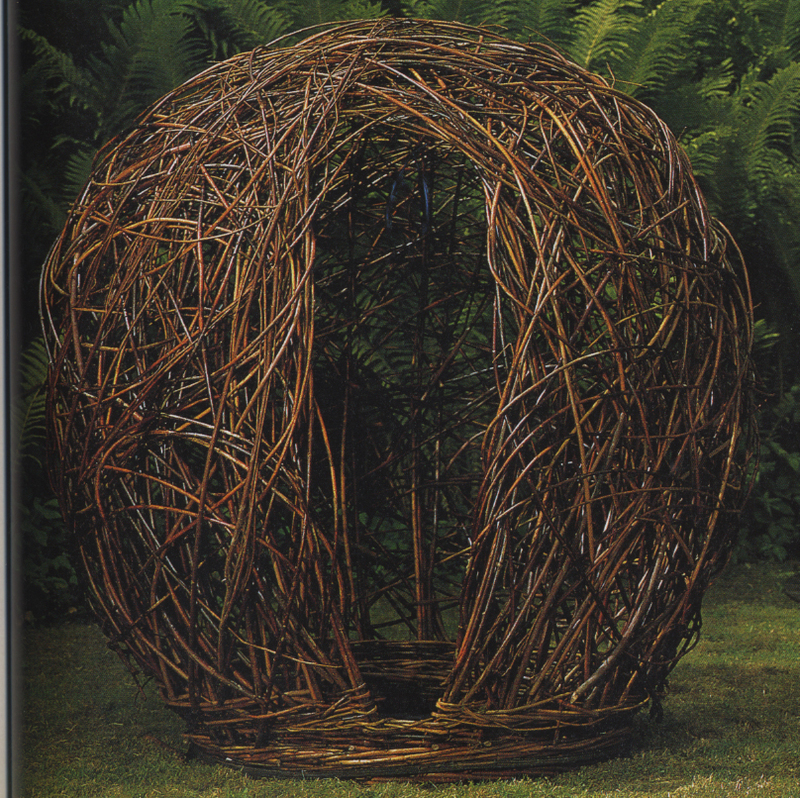 Once there are enough sticks woven into the structure, the weight in the centre can be removed….and voila. It stands up by itself and is remarkably strong. 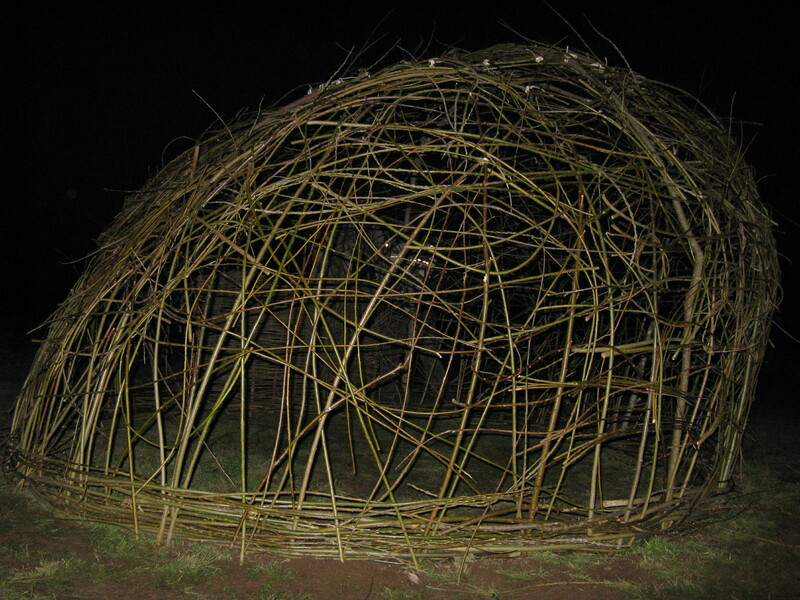 The finished structure can comfortably seat 12 adults in a circle, and the uprights should hopefully take root and grow to produce more wands to weave in. 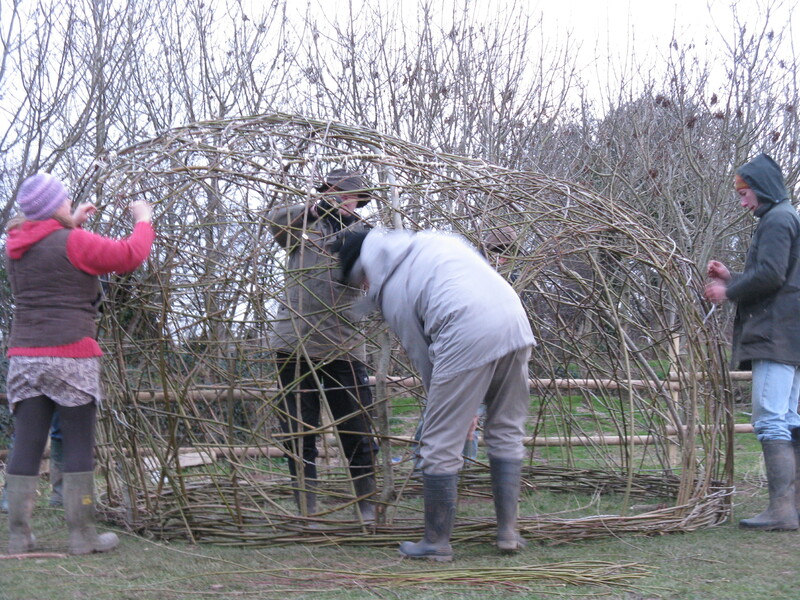 Note: The structure takes a large amount of willow to construct. 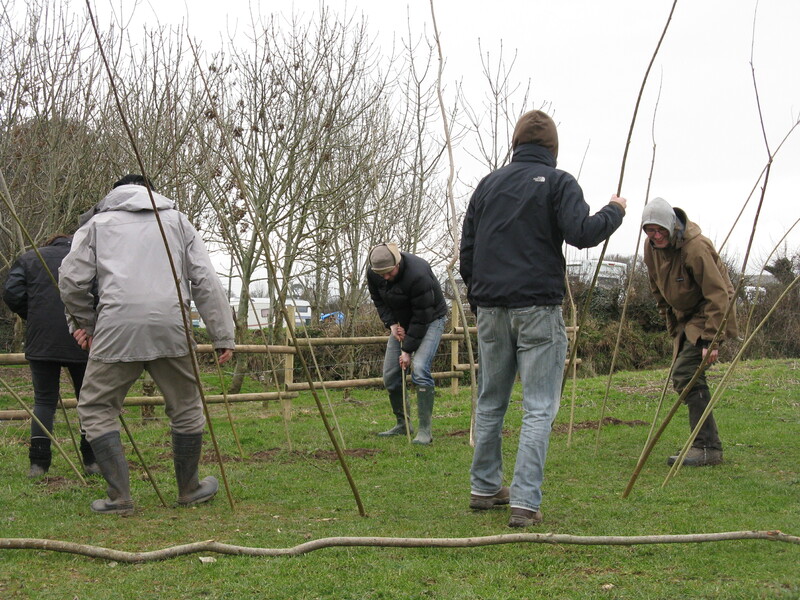 We used 16 x 12ft – 16ft poles and 5 bundles of 4 – 6ft wands to make the finished nest. We could easily have used more! This entry was posted on March 18, 2011 at 12:34 pm and is filed under Portscatho. You can follow any responses to this entry through the RSS 2.0 feed. You can leave a response, or trackback from your own site.